It's been a while since I wrote anything about Ben and our ongoing challenges with living with and managing his ADHD. We started seeing a pediatric neurologist, who did a slew of tests, and surveys of both of us (his parents) and his teacher. 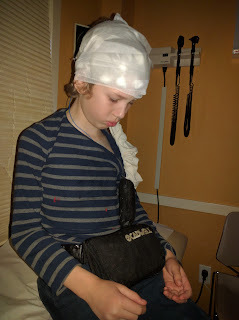 Ben also had to do some computer testing, and needed to sit through an EEG. That was the hardest part, seeing him attached to a machine like that, and to try to sit still. When all was said and done, this doctor not only had answers, but some solutions as well. It all boils down to medication. Ben scored fairly low on the attention spectrum, and after a few false starts, is now happy and pretty successful on a dose of medication. I was really against the idea for a very long time, but now I can see how it softens the hard edges. He's still spirited, impulsive or just plain headstrong, but he can sit for lengths of time, to do school work, homework. He can eat a meal with us, or play Minecraft without slipping into a table-flipping rage. A tiny part of me still bristles at medicating a kid who isn't even eight years old, but I know what is expected of a neurotypical kid, and without the help, Ben isn't there. It's the right thing for us, for him and I'm glad we live in a world where it's possible to get him that help.